We Offer a diverse range of customized Monolayer Blown Film Lines to suit a customer's specific requirement. Our most appreciated Monolayer Blown Film Plant are available with outputs ranging from 35 kg/hr to 450 kg/hr and lay-flat widths ranging from 50 mm to 6000 mm for processing polymers as LD, LLD, HM / HDPE. 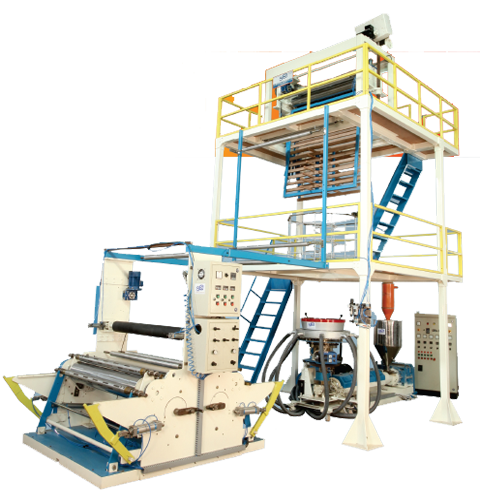 The Monolayer Blown Film Plant are also available with special configurations to process wide width HDPE film, similarly these lines are also available with up to 4 color inline flexographic printing. Our Monolayer Blown Film Machine incorporate advanced features like-grooved feed barrel, barrier screw, dosing system, Liquid PIB dosing system, manual as well as automatic screen changer, Rotating Die / platform , internal bubble cooling, automatic bubble cage, online thickness monitoring and control, 2/4 station surface and center winders , Auto tension control, Corona treaters etc. for longer life, higher productivity and better quality.